↑ "Law of the People's Republic of China on the Standard Spoken and Written Chinese Language (Order of the President No.37)". Gov.cn. ສືບຄົ້ນເມືອ 27 April 2010. "For purposes of this Law, the standard spoken and written Chinese language means Putonghua (a common speech with pronunciation based on the Beijing dialect) and the standardized Chinese characters." ↑ "China". Encyclopaedia Britannica. ສືບຄົ້ນເມືອ 2010-03-15. "Form of government: single-party people's republic with one legislative house"
↑ "People's Republic of China". US State department. 5 August 2010. ສືບຄົ້ນເມືອ 2011-01-31. "Communist party-led state." ↑ Rough Guide to China (5 ed.). Rough Guides. 2008. p. 7. "China is a one-party state run by the Chinese Communist Party"
↑ China – People. CIA.gov. 2011. ສືບຄົ້ນເມືອ 1 January 2010. 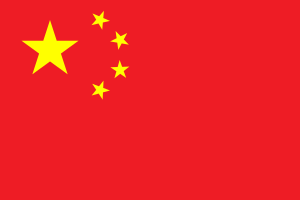 ↑ ໖.໐ ໖.໑ ໖.໒ "People's Republic of China". International Monetary Fund. ສືບຄົ້ນເມືອ 2010-10-06. ↑ "Human Development Report 2010". United Nations. 2010. ສືບຄົ້ນເມືອ 5 November 2010. ↑ "ICANN Board Meeting Minutes". ICANN. ສືບຄົ້ນເມືອ 25 June 2010. ↑ "GDP expands 11.4 percent, fastest in 13 years". Chinadaily.net. 24 January 2008. ສືບຄົ້ນເມືອ 15 June 2009. ໜ້ານີ້ຖຶກແກ້ໄຂຄັ້ງລ້າສຸດເມື່ອວັນທີ່ ໒໘ ພະຈິກ ໒໐໑໘, ເວລາ ໑໔:໑໓.